The Central Bank is in the process of introducing a flexible inflation targeting framework with the assistance of the International Monetary Fund (IMF) to support Sri Lanka’s economic growth objectives and flexibility in exchange rate management. 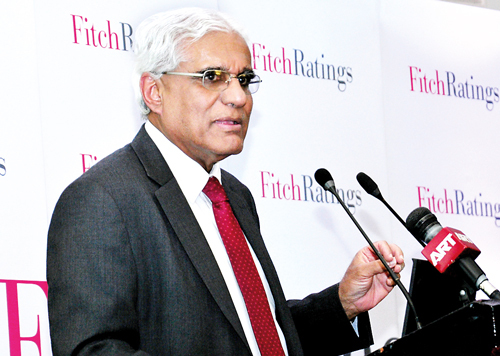 Delivering the keynote address at Fitch Sovereign and Banking Forum 2017, Central Bank Governor Dr. Indrajit Coomaraswamy said the successful transition to a flexible inflation targeting regime will enable them to set the monetary policy more proactively. “We are moving from targeting monetary aggregates to targeting inflation. This requires a lot of technical work. The thing about inflation targeting is that you have got to learn the technical skills how to forecast inflation accurately. We are getting assistance from the IMF to do that. We have set up a macro modelling unit and are increasing our forecasting capacity,” he added. Highlighting the benefit of this initiative, Dr. Coomaraswamy asserted that from a business point of view it will have less volatility in interest rates, which will enable the economy to be ahead of the game from what it has been in the past. “The peaks will be low and the troughs will be higher, where you will have a smoother trajectory of interest rates once we introduce this flexible inflation targeting framework,” he noted. Commenting on the exchange rate policy, he said Sri Lanka has historically tried to defend the rate often using borrowed reserves, which he termed double whamming. He said the Central Bank will have a more flexible exchange rate policy where it will only intervene if it notices serious market volatility that is not justified by the fundamentals. He also said that they will be very firm on speculations and if they see it the parties involved will be scrutinised through open market instruments. On the debt dynamics, he said this year and next year there is a peak in terms of domestic repayment, while there is a bunching of external debt repayments from 2018 onwards. “We have got over the worst of this year. We have seen that the Central Bank holding treasury bills have come down from $ 300 billion to about $ 188 billion and we want to get it down a little bit more by the end of the year. You will also see the interest rates coming down,” he stressed. Noting that from August onwards there are no bond issuances, Dr. Coomaraswamy said the Central Bank intended to take advantage of those five months to raise money to build a buffer to meet the debt repayments next year. In addition, he said the Central Bank will introduce a new auction system at the beginning of August which is yet to be approved by the Monetary Board. He said if the Government was able to maintain fiscal discipline beyond 2018, this would become more manageable. On the external debt side he said from 2018 onwards up to 2022 there is a sovereign bond maturity every year and there is a serious commitment towards it. In relation to that, he said the Government is going to set up a separate account at the Central Bank and proceeds of the divestment of public assets will be placed in this account and earmarked specifically for liability management on external debt. In terms of reserves, the Governor asserted that it is at $ 6.8 billion after the sovereign bond issue and syndicated loan and the target they have for this year is $ 7.2 billion. While stating that the level of reserves is important, he also stressed that the composition was something they are working on at present with more non-borrowed inflow. “Between 1 March 2017 and 6 June the Central Bank has purchased over $ 700 million without undue pressure on the interest rate. The Central Bank is purchasing $ 1.2 billion directly from the market. We are switching away from short-term swaps. We have to purchase $ 500 million more in the last seven months of the year. We are paying off short-term swaps and purchasing directing from the market, which will improve the quality of our foreign reserves. If the asset sales of the Government also come it will help generate a non-borrowed foreign reserves composition,” he added.